Learn Cutting-Edge techniques that can change your life TODAY! A book of easy, super explicit tools to immediately stop worry, panic attacks and dysfunction and embrace the life you want and deserve. The suggestions are simple, the results are life-changing! 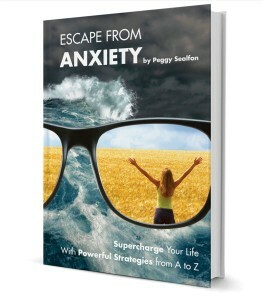 An A to Z guide with over 100 transformational strategeies for relieving anxiety, worry and fear. This comprehensive book is organized to be used as either a quick reference for instant relief (by opening to any page of the alphabet in Part I The ABCs and following the advice). Or for a more sustainable, more permanent shift, readers can thoroughly read from A to Z and then follow the more in-depth strategies in Part II Supercharge Your Life. Peggy Sealfon shares her insightful personal experiences along with a vast variety of techniques that teach you how to “uncover a calmer place of balance and joy, an inner space from where you can flourish and thrive…” The methods are based on current research in the neurosciences combined with ancient yogic disciplines and pscyhological methodolgies.